Chocolate wine first appeared on the English culinary scene in the 1660s, soon after the arrival of chocolate itself, which was known during the reign of Charles II as “the Indian nectar.” Made by blending a fortified wine like Port with sugar and chocolate, doctors of the day thought that this luxurious combination was a powerful aphrodisiac, “provoking lust, increasing seed and adding to the vigour of procreation.” Inspired and informed by the past, The Hinds Head – Heston Blumenthal’s newly Michelin-starred gastropub in Bray, has reinvented chocolate wine for the 21st century, giving it the granita treatment in its Chocolate Wine Slush dessert, served with “Millionaire’s Shortbread”; a glorified, gold leaf-flecked Dime bar. 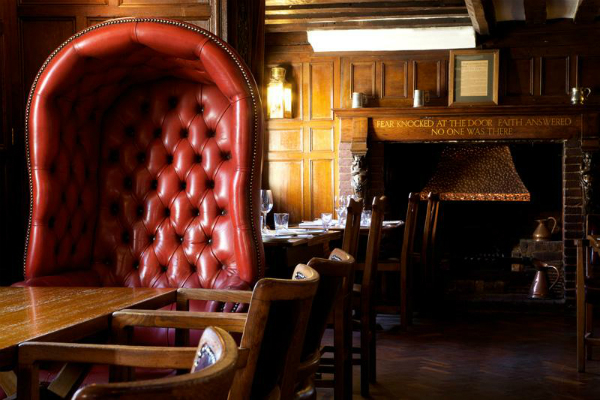 Nestled in a triangle of prime restaurant real estate within spitting distance of both The Fat Duck and The Waterside Inn, The Hinds Head is housed in an early Tudor listed building originally used as a royal hunting lodge. Interiors are cosy, country pub chic – all low beams, polished wooden benches and roaring fires, while the modest white exterior is festooned with Union Jack bunting. Unlikely patrons Errol Flynn and Walt Disney have both dined within its walls during a previous incarnation, while Prince Philip held his stag do here before he made an honest woman of the Queen in 1947. 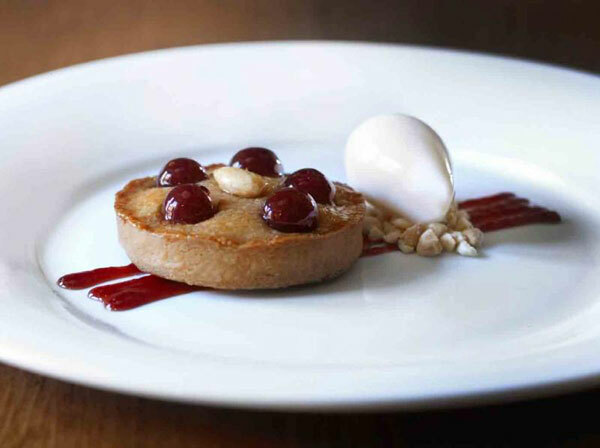 Like the Michelin-starred Dinner by Heston Blumenthal at The Mandarin Oriental in Knightsbridge, The Hinds Head, run by head chef Kevin Love, uses seasonal ingredients to recreate historic British dishes from the past, such as powdered goose and quaking pudding, with the help of food historians at Hampton Court Palace. Taking the train to Bray from London one muggy late summer afternoon, on arrival, I was lucky enough be ushered to “Heston’s chair” – a quilted, red leather butler’s chair that merited a carriage of its own. Heston apparently perches here when he pops in for lunch. Proceedings begin with wickedly moreish devils on horseback, made of dried prunes wrapped in bacon, which deliver a punchy union of savoury and sweet. Itching to try the award-winning quail Scotch egg, when broken into, its deliciously crunchy, golden brown outer shell revealed a gooey, canary yellow yolk and moist, juicy meat. Cooked to perfection and served with the best mustard I’ve ever tasted, we were off to a flying start. Bringing its cocktail list in line with its food offering, head bartender David Ashton-Hyde has hit the history books and conjured a playful selection from his box of tricks, filled with nostalgic nods to childhood memories. White Fizz, for example, is served in a miniature milk bottle with a straw and a tiny chocolate cookie resting beside it, evoking the carefree days of milk, cookies and an afternoon story at school. In reality, the contents is far less innocent, filled with Chase apple gin, apple liqueur, cane sugar, lemon and egg white. Smooth and creamy from the egg white, but with a sharp citrus kick, it slipped down easily, leaving me craving for another bottle. Having cemented his fame with snail porridge at The Fat Duck, it seemed only right to sample Heston’s hash of snails. 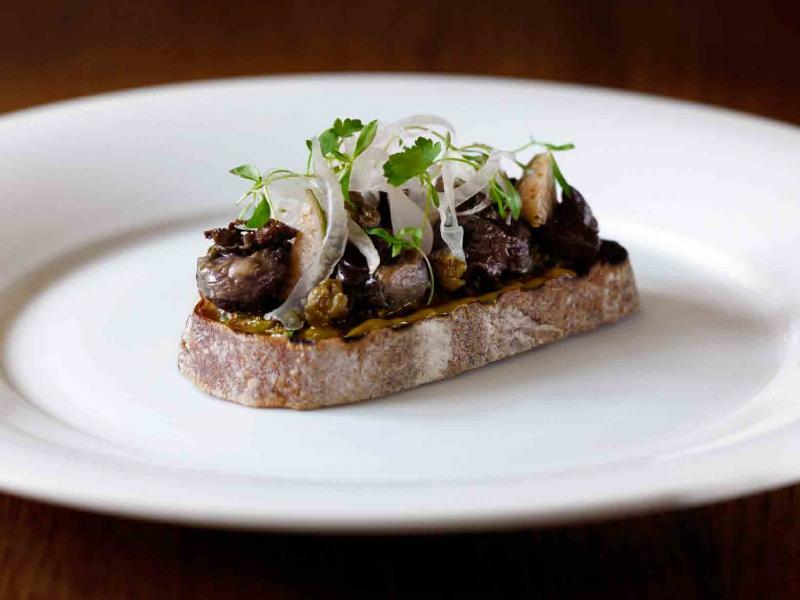 Served on a crispy bruschetta with ghostly shavings of refreshing fennel and a verdant cress roof, the slippery snails were tempered by the fragrant fennel and the tang of the pickled onions lurking beneath in a masterful marriage of texture and flavour. Fittingly for a night in the mad hatter’s clutches, I was then presented with a Queen’s Tea Party cocktail in a bone china cup – a bittersweet mixture of Hendrick’s gin, Earl Grey syrup and basil complete with ice and a slice of grapefruit. A mini main of soused mackerel with cucumber, pickled lemon and horseradish, was invigoratingly aerating, the sharp, vinegary tang of the pickled lemon perfectly complementing the smoky intensity of the mackerel slithers, their silver tops glinting in the light like precious metal. A modest side of baby spinach salad in an anchovy dressing with pine nuts and the loftily titled “Lord of the Hundreds” cheese, was sensational: rich, creamy, nutty, indulgent, and yet with an underlying freshness. The attention paid to the smallest of details in the dishes illustrates how switched-on the chefs here are, and why they won that Michelin star. They understand how to put flavours together on a plate so that they become so much more than the sum of their parts. Tragically, Heston’s signature triple cooked chips were off the menu on my visit, as our damp squib of a summer meant the Maris Piper potatoes he uses had failed to flourish, and he refuses to make them with any other spud. My main event is a decadent, painterly slice of pink ham hock and flesh-coloured foie gras terrine, served with tangy homemade piccalilli to cut through the symphony of fat. While my dining companion is served a “Charles Dickens” brandy, rum and citrus punch in a silver hip flask within a copy of Great Expectations, my final libation of the evening – a Strawberry Sweetshop, is more Roald Dahl than Dickens, designed to evoke the dizzying excitement of entering a sweetshop as a child, shiny fifty pence piece in hand. Made with Chase vodka, strawberries and lemon sherbet, the sugary sweet drink, served with a lemon sherbet rim begging to be licked, recalled soothing strawberry bon bons, mouth-puckering sherbet lemons and fizzy sherbet fountains colliding in an explosion of syrupy nostalgia. The sweet elixir sent me on a soaring sugar high, which peaked with a textured treacle tart, its moist treacle top and crumbly malt base lifted by a nervy citrus zing within. The Hinds Head is hard to fault. In casual, cosy surroundings, it adroitly delivers a snapshot of Heston’s quirky take on historical dishes and childhood nostalgia for a fraction of the price of both The Fat Duck and Dinner. The man himself may not be behind the stove, but his inimitable stamp is branded on both the dishes and the drinks. Its new star is richly deserved – book your train ticket to Bray before the Michelin stargazers do. 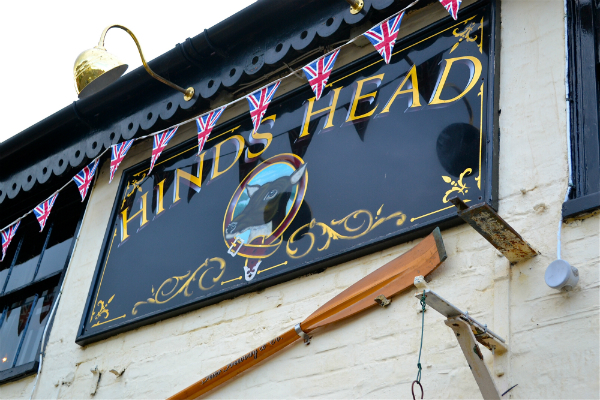 The Hinds Head, High Street, Bray, Windsor SL6 2AB. Tel: +44 (0)1628 626151. Website.